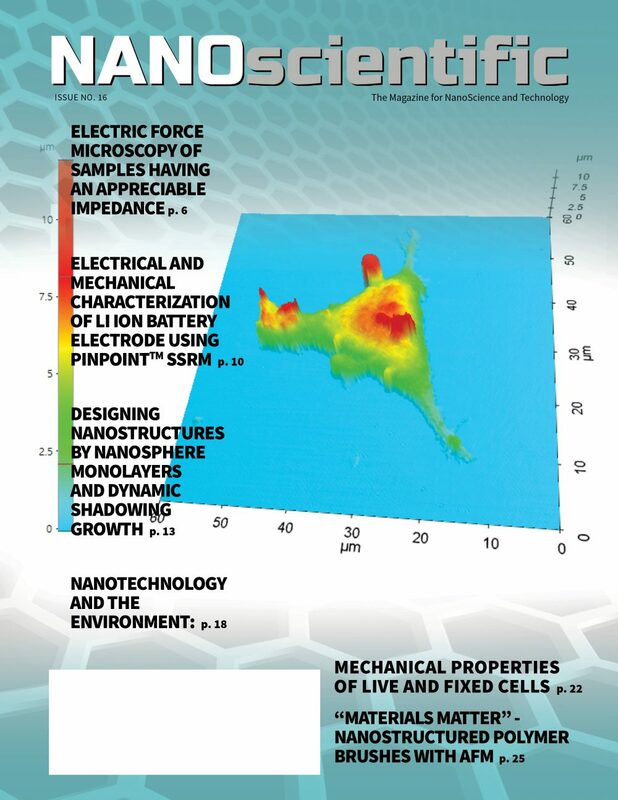 In recent years, the importance of mechanical properties measurement has become evident in various applications, ranging from understanding and screening of integrated circuit failure mechanisms of microelectronics, to diagnosis of diseases in the field of medicine, and to the development of restorative materials for human teeth [1-3]. However, during the measurement, some samples when pressed with too much force can lead to surface deformation and change in its surface characteristics that may result in inaccurate measurements. Moreover, since the sizes and features of interest in functional materials are continuously shrinking down to nanoscale level, and given that material failures start from atomic lattice structures, conventional techniques used in materials characterization are no longer adequate in identifying defects and abnormalities on material surfaces as they only allow up to millimeter range measurements. For these reasons, a next generation characterization tool that is benign and allows for nanoscale measurements is greatly needed. 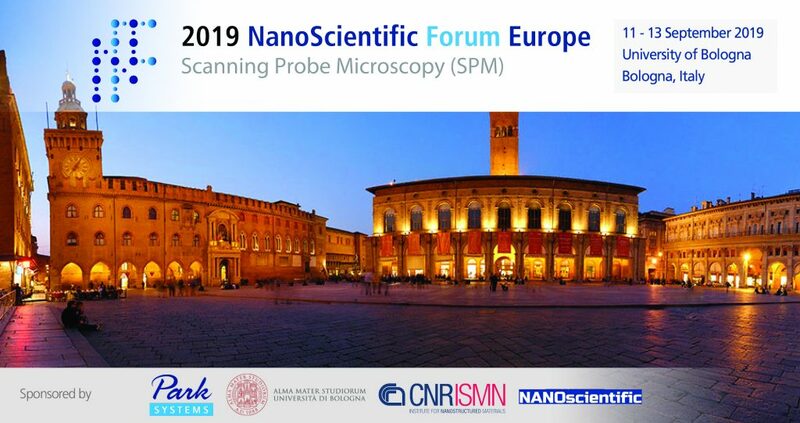 Recently, a new operational AFM mode developed by Park Systems called PinPoint™ Nanomechanical mode  offers researchers an innovative solution to these problems. This technique operates by moving the tip horizontally and moving down vertically in approach-retract manner with only few nano-Newton force. This ensures a frictionless operation that eliminates the lateral force due to continuous tip-sample contact. Furthermore, it preserves tip and sample condition. At each point of the image, force-distance curve is acquired and used to calculate the mechanical characteristics of the sample. During the data acquisition, the XY scanner stops, and the contact time is controlled to give enough time for the scanner to acquire precise and accurate data with nanoscale resolution. Every material structure deteriorates over time when kept in natural setting. Such changes originate from a point defect at the nanoscale level. This applies to the teeth whitening process. Everyone who whitens teeth desires for the teeth to remain whitened without redoing it often. Thus, to realize this, one must know how the topological and mechanical changes take place on the surface of teeth at the nanoscale level. In this study, PinPoint Nanomechanical mode was used to acquire topographical and mechanical data of a tooth sample to understand the effect of tooth whitening strips on the tooth’s mechanical and topographical properties. The results show that tooth whitening strips lead to a decrease in tooth roughness and an increase in modulus and adhesion. This newly developed technique by Park Systems enables researchers to investigate the topographical and mechanical properties variations of different varieties of samples at nanoscale level. A tooth sample was analyzed using a Park NX10 AFM  under ambient air condition. PinPoint Nanomechanical mode with AC160TS cantilever (nominal spring constant k = 26 N/m and resonance frequency f = 300 kHz)  was used in the measurement to acquire topography and mechanical signals. 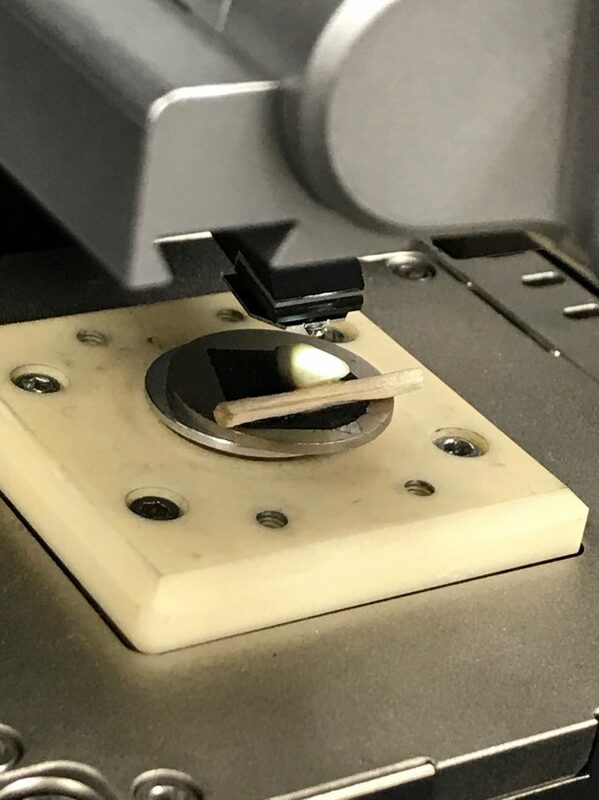 Before undergoing AFM scanning, the tooth was treated by placing it in deionized water and leaving it to sit for 30 minutes followed by placing it in 50% by volume isopropyl alcohol for 2 minutes, then rinsing it again in deionized water. Compressed air spray was used to dry off the tooth. This was in attempt to remove “debris” and “dirt” from the teeth that may have accumulate on to the teeth over the time. Figure 1 shows the setup of the experiment. A carbon tape and super glue were used to stabilize the sample during imaging. Tooth was placed onto a magnetic disk and stuck to double sided carbon tape. To be sure that the tooth was secured so that it would not move while taking measurements, a toothpick was placed to hold the tooth upward so that an area of the tooth would be leveled for examination. Superglue was used for extra stability. by Park Systems which mapped the acquired signals to a color table. The darker regions (color black in Fig. 2 left) with circular features represent the areas with lower modulus values while the lighter regions (color brown in Fig. 2 right) with flat surface known to be the PS matrix are the areas with higher modulus. All areas with purple color mean that these areas are excluded in calculating the mean modulus value. The calculated elastic modulus mean of the LDPE copolymer region is 0.116 GPa while for the PS polystyrene flat region is 2.039 GPa. 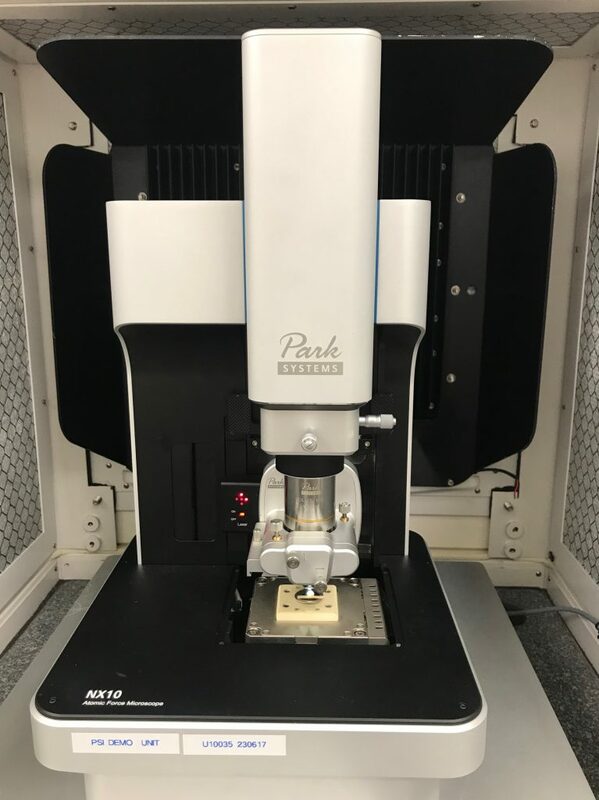 After the reference sample measurements were taken, the tooth was placed under the Park NX10 AFM with the same tip used for reference sample measurements. For statistical relevance, three measurements were taken at three different teeth surfaces of the same teeth sample that could be found using the optical microscope built in to the Park AFM. Measurements were taken in areas of the tooth no farther than 500 microns apart so that roughly the same area are imaged consistently. These measurements were performed using the same scan parameters as were used for the PS-LDPE reference sample. These parameters were utilized because under those conditions, the AFM recorded accurate modulus values. To whiten the tooth sample, whitening strips were used . One strip was applied onto the tooth surface and left to sit for the recommended 1-hour period. After this, the tooth was rinsed in deionized water and dried off with compressed air spray. A total of 3 whitening strips were used as the final whitening. Figure 2. 15 µm x 15 µm image of PS-LDPE reference sample. Image with polystyrene flat region excluded in the elastic modulus mean calculation (left). Image with copolymer region excluded in the elastic modulus mean calculation (right). Table 1. A table of before and after whitening treatment was applied. The same 15 µm 15 µm scan region was used for the before-images, as well as the after-images. These images used were representative of the change caused by whitening treatment, as the data values coincided closely with the mean. Scale bars: 3 µm. The representative topographical and mechanical images acquired in the experiment are presented on Table 1. The images are analyzed using the Park XEI software. The quantitative results of surface roughness and mechanical properties are shown in Table 2. The experimental values of the elastic modulus before and after the whitening process are compared on the previous studies . The tooth is composed of three major layers, known as the enamel, dentin, and cementum. These layers are found in the respective order: enamel at the surface, dentin underneath the enamel, and cementum underneath the dentin. Based on the existing studies, the elastic modulus of the top layer of the tooth was found to be 1.3382 ± 0.3079 GPa. The measured value of the elastic modulus before the whitening process was 1.072 GPa and it increased up to 1.571 GPa after the process. Same trend is observed on the adhesion energy values wherein the measured adhesion energy prior to the process was 0.196 fJ and it increased to 1.608 fJ after the whitening process. 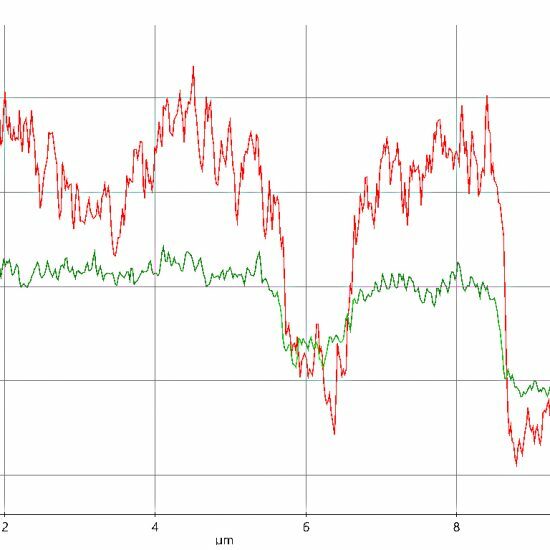 On the other hand, the surface roughness is observed to be in decreasing trend wherein the surface roughness prior to the process was 201.0 nm while the value for surface roughness after the process was 38.33 nm. lower modulus than the enamel itself. The topography and mechanical data of the tooth sample was successfully acquired using PinPoint Nanomechanical mode on Park NX10. Based on the data acquired through this testing, PinPoint Nanomechanical mode found that its method of characterizing mechanical properties of the tooth matched and agreed with mechanical properties found in other methods such as macro and microindentation. It was also found that the tooth roughness decreases and the elastic modulus as well as the adhesion properties increase after it had undergone whitening process. Overall, PinPoint Nanomechanical Mode AFM technique is an ideal approach to characterize and quantify mechanical properties at nanoscale, with best precision and maximized tip life due to its frictionless and to the point operation. 1. 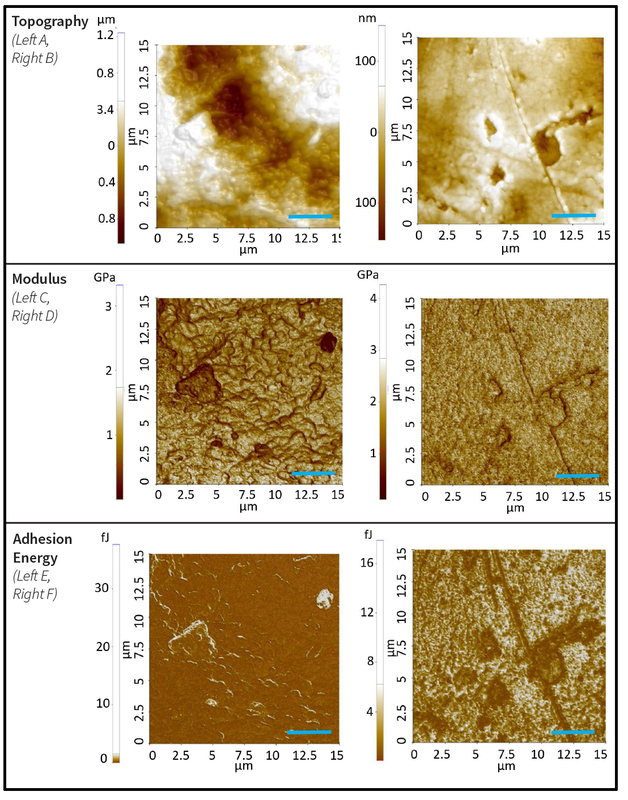 J. Vella, et al., Mechanical properties and fracture toughness of organo-silicate glass (OSG) low-k dielectric thin films for microelectronic applications, International Journal of Fracture 119/120: 487–499, 2003. 2. 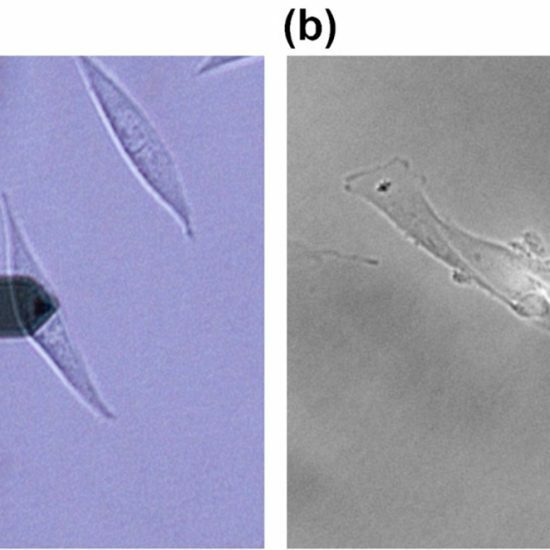 M. Oyen, et al., A practical guide for analysis of nanoindentation data, J Mech Behav Biomed Mater. 2009 Aug;2(4):396-407. Doi: 10.1016/j.jmbbm.2008.10.002. Epub 2008 Oct 15. 3. Y. Zhang, et al., Review of research on the mechanical properties of the human tooth, Published online 2014 Apr 18. Doi: 10.1038/ijos.2014.21. 10. 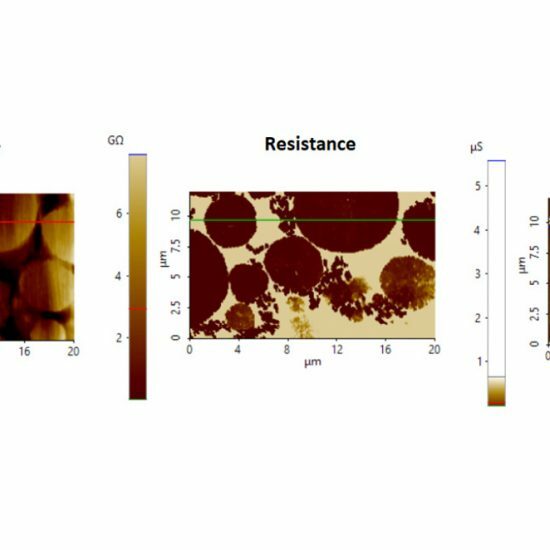 C. Pinto, et al., Peroxide bleaching agent effects on enamel surface microhardness, roughness and morphology, Braz. Oral res. Vol.18 no.4 São Paulo Oct./Dec. 2004. 1 Alvin Lee is an intern, undergraduate student from Worcester Polytechnic Institute, Worcester, MA.